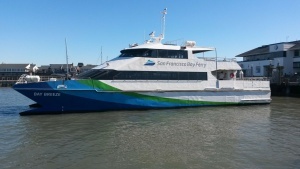 San Francisco Bay Ferry is a provider in the Bay Area that manages commuter ferry routes to and from the East Bay. SF Bay Ferry is a brand of Water Emergency Transportation Agency. Ferry tickets are sold at Vallejo Ferry Terminal, Pier 41, and the Bay Crossings store in the Ferry Building. The ferry fare can also be paid onboard, which accepts cash, credit/debit card, and transit vouchers. Clipper cards can be used to pay for the ferry fare. To ride the ferry with Clipper, tag card once at the Clipper reader located by the pier before boarding the ferry, and tag again at the destination pier after disembarking the ferry. These steps (similar to that on Caltrain) ensure proper fare is charged. AT&T service does not accept Clipper. Passengers wait outside the pier until the vessel has docked. Crew members will unlock the gate to the pier and begin boarding. Food and beverage are available for sale on the ferry. Bicycles are permitted on the ferries on a first come first served basis without an additional fare, but capacity varies depending on vessel type, which range from 10 bikes to 50 bikes. The ferries and terminals are accessible to disabled riders. Ferries also have accessible restrooms.